LoRa has been getting a lot of attention lately: IBM, Cisco, and Espotel to name a few. She caught my eye early on, but I didn’t really like the idea of thousands of motes broadcasting messages through transparent ‘dumb’ gateways to a central server in the cloud before any useful actions could be taken on the data. If the server wanted to send down a response, it had to do so within the mote’s small receive window. The design doesn’t feel scalable, and I don’t want to pay for cellular data usage or compute cores just to throw the data away when it should have been dropped at the gateway. If the solution doesn’t have to be hooked into the Internet, a more closed system may be a simpler, safer, and more cost effective solution. 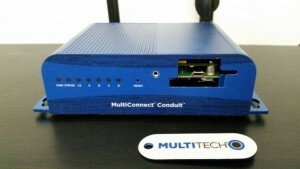 Enter Multi-Tech’s programmable gateway, the MultiConnect® Conduit™. Multi-Tech Systems is one of the first companies to release a LoRa network gateway that allows the LoRa network to be managed … wait for it … at the gateway. I imagine there is some work to be done to make this compatible with Semtech’s LoRaWAN architecture, but since it is a programmable gateway, if you wanted to, you could just run the ‘dumb’ packet forwarder to transform it into a transparent gateway. An all or nothing approach is fine for a lot of situations. This product allows developers to run custom rules and logic on the upstream data at the gateway to determine if immediate action should be taken, or if the data should just be dropped. Between its swappable hardware accessory cards, and its open development platform (mLinux), this LoRa gateway has everything it needs to provide a private, self-contained, Intranet of Things solution. On top of that, the software on their LoRa motes (end-points) are built using ARM’s mbed platform, making it very easy to provide custom logic on the RF module itself. Other times, you just want to be more cost effective. I hear vending machines have very low profit margins, and paying for cellular service at each unit or line of units is too expensive, and may not even be possible if cell reception is poor. LoRa has great penetrating power and low-cost end points in comparison to cellular modules. You won’t be sending video advertisement media over the air with this, but knowing when restocking or maintenance is needed could be worth the investment. There’s an article showing the range of indoor LoRa motes with an integrated antenna reaching a distance of 2.5 km. Anyway, I just got my LoRa Development Kit so I thought I would write a ‘hello world’ article. 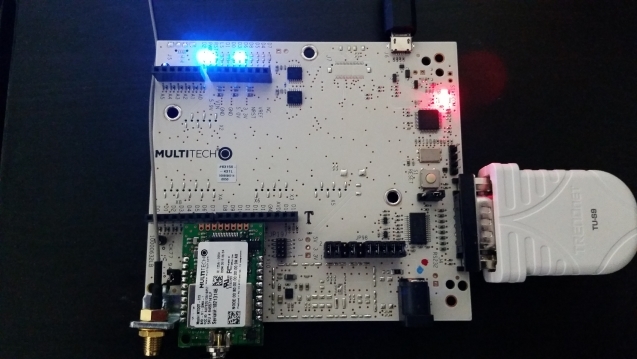 I will walk through the steps to get a private LoRa network up and running on Multi-Tech’s Conduit using a MTAC-LORA accessory card, a MultiConnect® LoRa mDot™ mote, and Multi-Tech’s UDK developer board. I plan on doing an article on developing custom images for the Conduit using Yocto, and one on building mbed apps locally for the mDot. The end goal of this is to help make the transition of power over to the machines as smooth as possible once they become self-aware. You’re going to want to be on the winning side. Alright, if you don’t have one already, grab a beer and lets get started. 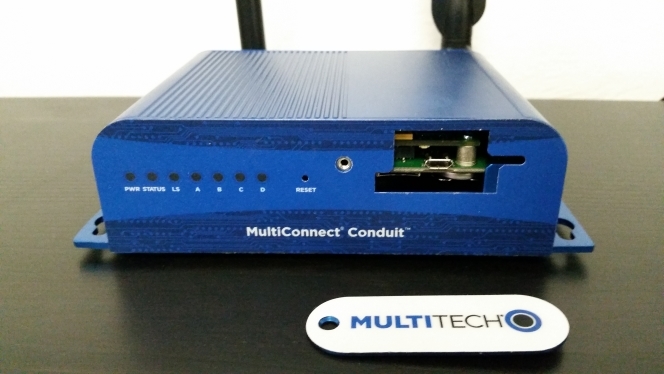 The MultiConnect Conduit has two hardware accessory card slots that make hardware I/O configurable. Multi-Tech currently has a Multi-Function Serial card, a GPIO card, and a LoRa Gateway card, with WiFi/Bluetooth and Ethernet cards on their roadmap. This particular version of the Conduit also has a built-in cellular radio (Telit HE910). Plug in the LoRa Accessory Card (MTAC-LORA) and supply power to your Conduit (MTCDT). The Conduit’s default address is 192.168.2.1. Most of the time you’ll probably be interacting with the Conduit over Ethernet, but for the initial setup I found it easier to use the serial debug port for configuration. Unscrew the front Multi-Tech logo and access the micro-USB serial debug port. Be very gentle with the micro-USB serial debug connector so it doesn’t accidentally break off. Teraterm and putty work to access the Conduit on Windows; minicom, microcom, etc can be used on Linux. The baud rate should be 115200. Access the Conduit using the default username and password (root:root). 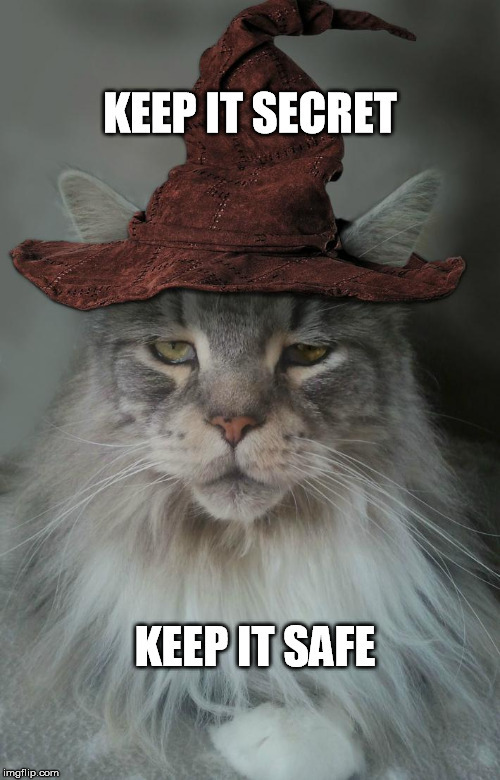 WARNING: The following command rolls a 1 in 6 chance to delete your entire file system. 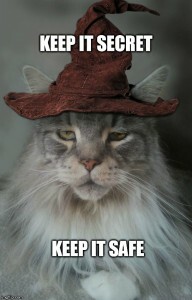 You’ve been warned. The MultiConnect® mDot™ LoRaWAN™ ready, low-power wide area network RF module is a neat little mote that is mbed compatible providing developers with the option to put brains on the mDot itself instead of just using it as a transport. I will put together an article on using ARM’s mbed site for mDot application development and how to pull the build system down for offline development, but you may be surprised at how easy it is, so in the mean time check it out yourself. Plug your mDot onto the UDK board and hook up to your PC via micro-USB and serial cable. There are no special drivers needed for this section, so if you are on Windows you can cancel any “searching for driver” installation pop-ups that may occur. If you want to setup the virtual USB COM port on Windows for debugging at this time, install STMicro’s ARM mbed serial port driver, but everything you really need happens on the serial port with the mDot’s default LoRa AT command app. The command AT&V will display the current settings. You should see something similar to the following when you send ‘hello’ up from the mote. The ‘data’ element is base64. “aGVsbG8=” decodes to ‘hello’ in ASCII. You will need the mDot’s device ID found by issuing the command AT+DI to the mDot. The ‘data’ element must be base64 encoded. Note that LoRa protocol states that downstream messages can only go out to the mDots at a specified interval from receiving an upstream message, i.e. the mDot always initiates communication, and only listens during a brief window after transmitting its message, so you may have to send another upstream message from the mote in order for the gateway to know when to send out the downstream message. The response on the mDot is in hexadecimal. 0x776F726C64 is ‘world’ in ASCII. Congratulations!! By now you are either drunk and/or have successfully validated that all the equipment you purchased actually works. In future articles I will go over developing a custom image for the Conduit using Yocto, and write up an article on developing software for the mDot. Thanks for reading and if you have any questions, corrections, or memes, please leave them in the comments below.